Brigham Young University geologist Jani Radebaugh, alongside researchers from NASA and the Naval Research Laboratory, has put forth a plan that would send a done to Titan. Their plan calls for the drone to operate on a nuclear battery transferring the power between a simple propeller and radio during its one year research flight. In addition to its rivers, oceans, mountains, sand dunes and winds, Saturn’s moon Titan may someday share another similarity with Earth: airplanes. In the journal Experimental Astronomy, BYU professor Jani Radebaugh and other scientists have put forward a plan that would send a nuclear-powered drone to Titan for a year-long flight to observe the most earth-like object in our solar system. Titan is 10 times more distant from the sun than Earth and has a methane atmosphere four times as dense. So far what we know of Titan has come from the Cassini spacecraft that orbits Saturn. In recent years Radebaugh led the discovery of Titan’s mountains and sand dunes based on images and data beamed back to Earth by Cassini. That’s why Jason Barnes, a former grad school classmate, invited her to work on the Titan airplane concept alongside researchers from NASA and the Naval Research Laboratory. To get a closer look, the proposed drone would operate on a nuclear battery barely strong enough to power a couple light bulbs. The battery would power a propeller except when it needed to beam data back to radio telescopes on earth. Prior to these transmissions, the drone would climb high into Titan’s atmosphere. Then power would shift to the radio cone in the drone’s nose as the aircraft glided back down to its usual flight altitude. While transporting the drone to Titan would take up to 7 years, the communication relay time once it’s there is a mere 90 minutes. 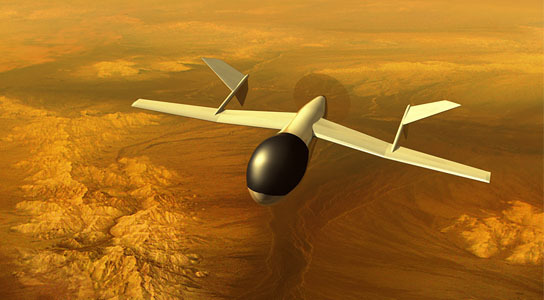 Be the first to comment on "Researchers Plan to Explore Titan with a Nuclear Powered Drone"